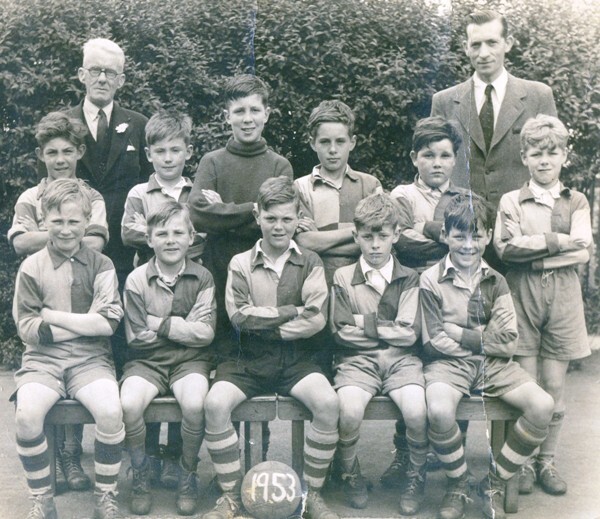 Barry Draper, formerly of 52 Distillery Road, provided this photo: the St George's primary school football team. I guess the ball gives away the year. Some of the spellings might need adjusting but I hope that it raises some discussion and some of the missing parts can be added. David Burkett, who features in the photo, supplied the missing names at the Brentford Local History Day, June 2013. The teachers at the rear are Mr Allen (headmaster) & Mr Church (form teacher). The site also includes some St George's School photos from Barry.